Doing the Christmas Gift idea round up? As we slide into November and the stores start getting ramped up for Christmas (my local MYER department store had the Christmas tree up in SEPTEMBER) it’s time to start thinking about whether or not we want to gift tangible gifts. I will have to admit that last year I got really lazy and didn’t bother with presents. The good thing about lazy is that it means that you don’t end up giving things that your recipients might not actually want. However, the idea of being able to show your gratitude for family and friends once a year in a tangible way can be pretty enticing for many. If you want to save some money, time (Christmas shopping can be arduous), and give a eco-friendly gift, then Moss Ball DIY might be an option. I’ve seen these around a bit but was actually gifted one by Katie from EcoBling (if you see her at the markets from time to time you can buy one from her) and decided to give it a go with my ten year old neighbourhood friend who comes and visits me to do craftwork. They are REALLY easy to make (my ten year old friend has requested something more difficult for out next crafternoon) but do get a little messy so it’s a good idea to make them outside. The best bit is that if you use natural jute to tie them they are biodegradable. Which means that if your gift recipient isn’t all that keen on your moss ball it can return to the earth rather than landfill. Something that holds water to dunk the ball and your moss in and to pour water on the soil. 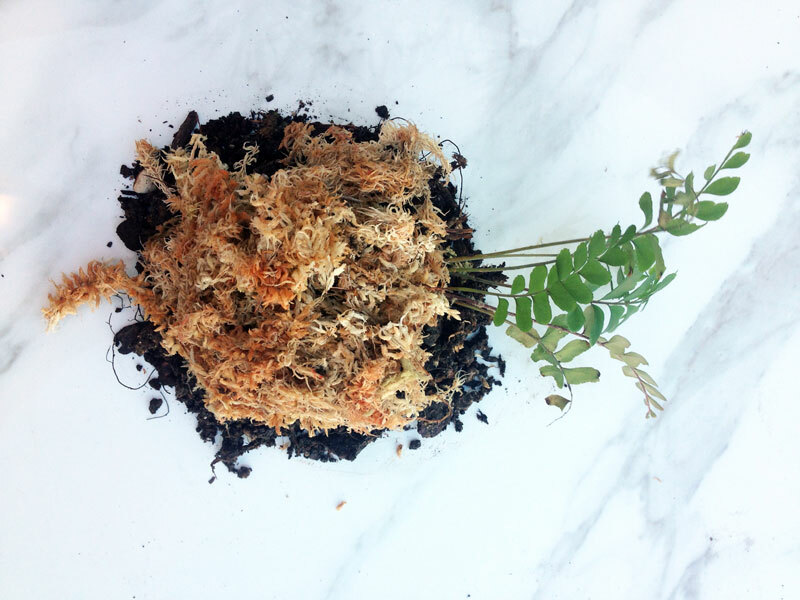 Take your plant out of it’s pot (or the ground) and assess it’s root structure. 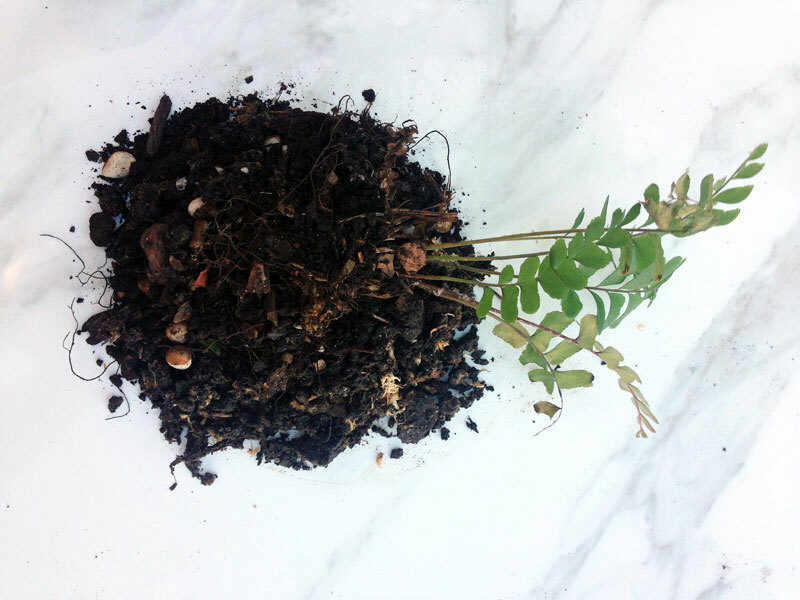 Moisten some soil so that it will hold it’s shape and stick together a little. 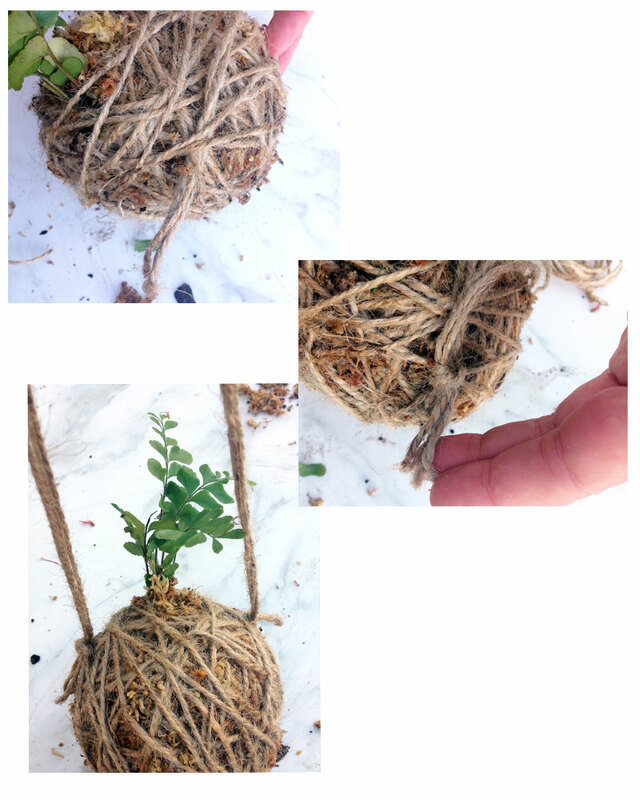 Safely hold the plant in one hand and start making a ball of soil (carefully) around the root system. It might take a bit of time to play around with this but it’s kind of like making sandcastles at the beach, you have to have the right consistency. 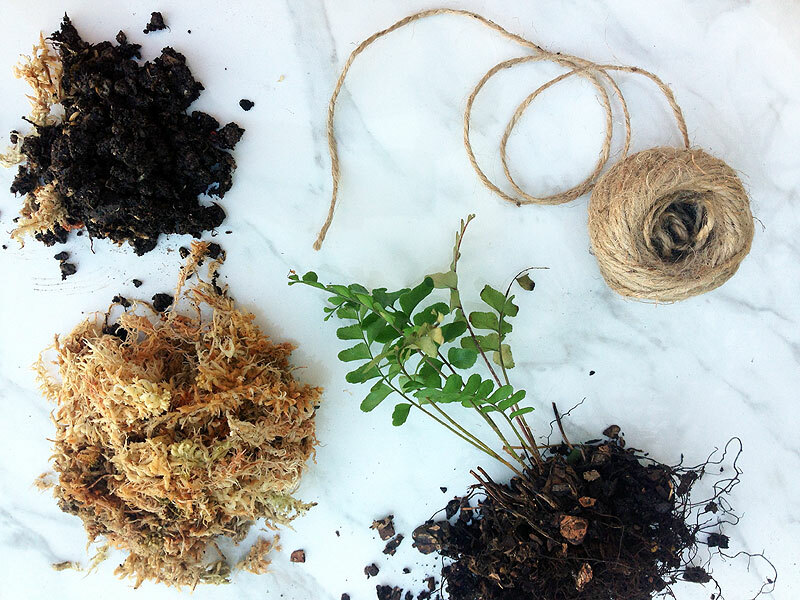 When your soil sort of sticks together in a ball like shape (or you have given up trying to get it to stick together and just want to wrap it up into a ball) layer some damp moss around it. The moss should make it easier to get your soil to stick together (sorry I don’t have a pic of this, I had my hands full the above pic should give a bit of an idea!). You can add an extra layer of soil and moss if you like or you can just start wrapping your string around the single layer of moss and soil. Basically the soil is for the plant to grow in (so make sure you give it enough) and the moss is like a ‘pot’ for the soil that has the added benefit of holding moisture for the plant to drink. 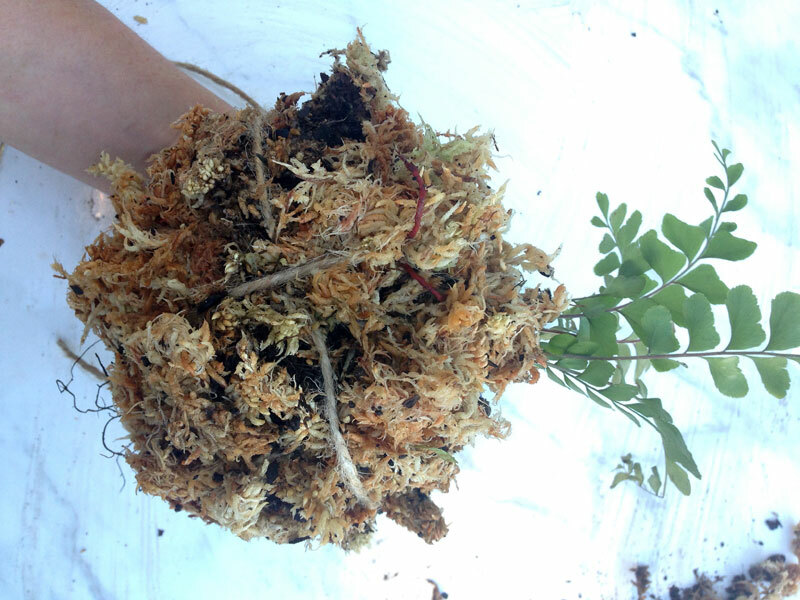 The more layers of moss and soil the larger the ball and the more moisture it will hold. 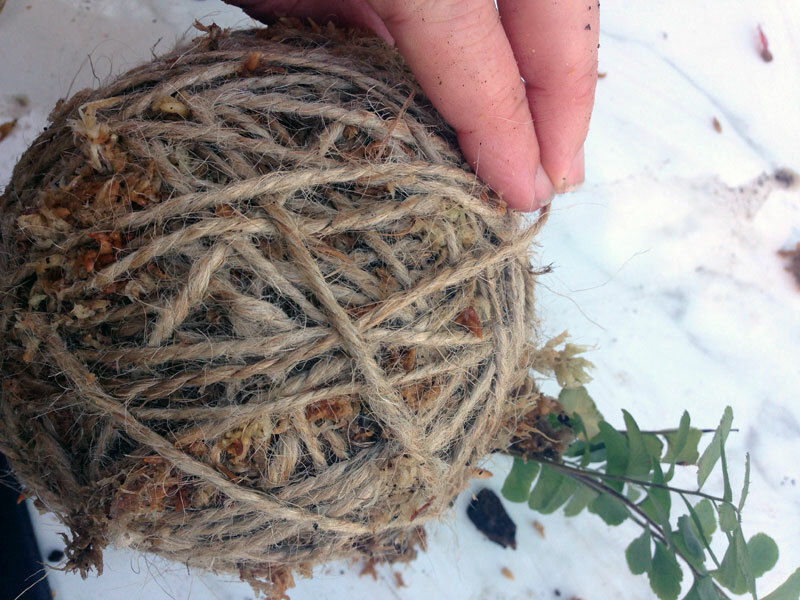 Wrap your string tightly around the moss ball to hold everything in place (as pictured above top). Keep wrapping until all your moss is held securely in place. It should feel a little bit like holding a coconut in your hands but a little spongy to touch. When you have enough string on your moss ball tie off the end and tuck it back under some of the string layers so it’s not sticking out (as pictured above bottom). 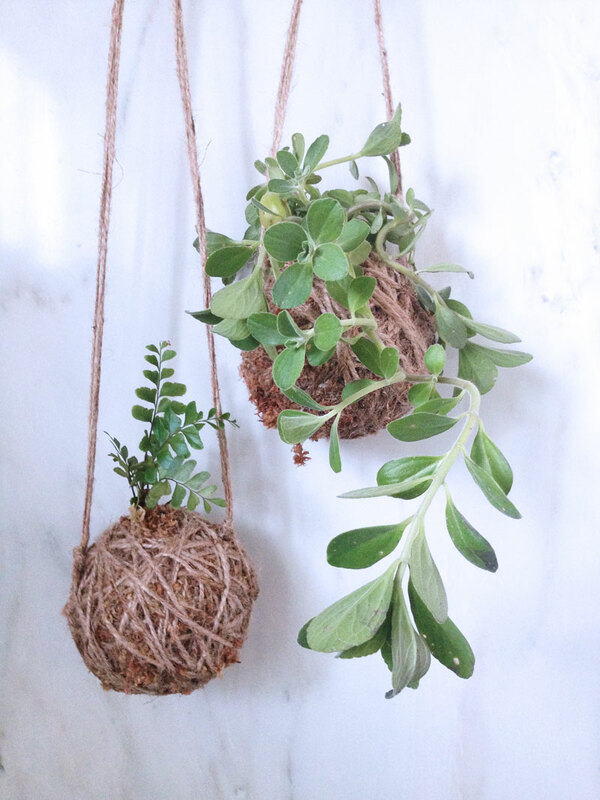 If you want to hang your moss ball you will need to attach a hanging string. 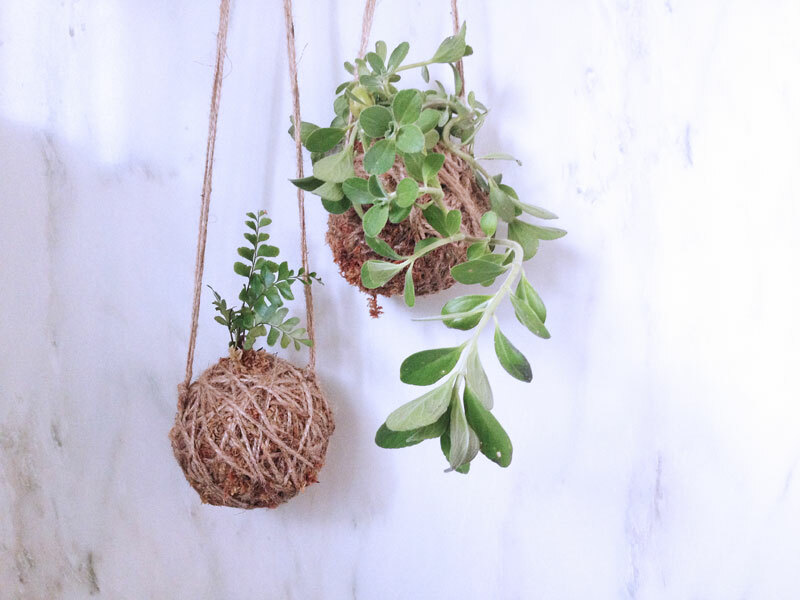 Your moss ball may be quite heavy (depending on what size you make it) so ensure that you have a strong length of string to support the weight. My ball was around 2kg so I tripled up my string to be strong enough to hold it. Fasten this length of sting to the moss ball by looping it under A FEW of the loops of sting on the moss ball. Don’t tie it to just one because it won’t hold the weight. Tuck/ weave the ends back under the string wrapped on the ball for a neat finish. Done! Care will be dependant on the plant you have planted. Succulents can handle being dry for a little while. Ferns and other moisture loving plants can’t. The best thing to do is to squeeze the ball every couple of days. It should feel a bit moist. If it feels dry give it a dunk in a sink or bucket of water to rehydrate the moss and soil. Every few weeks you can use a liquid fertiliser on it for some nutrients. If you are buying plants for this ask the people that you buy the plants from what kind of conditions they like best and you should be able to work out with them how often you will need to water them. How did you go with the project? Any tips? Have you invented an exciting variation? Share and ask questions below.